Chippewa Boots is brand that blends modern durability found in contemporary outdoor products combined with the heritage and authenticity of fine craftsmanship and work ethic. The Chippewa Collection is an assembly of vintage-inspired footwear for individuals who appreciate classic boots with a distinctive identity. 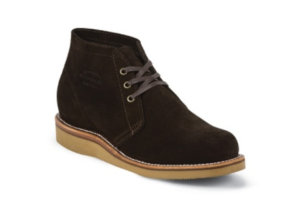 The bestselling Milford Chocolate is a 5-inch tall men's boot with casual luxury of a soft dark brown suede exterior with matching 3-strung laces on the vamp. This boot features a full grain, leather heel with padded insoles that effortlessly provide lasting support and comfort throughout the day. With its Vibram Heritage wedge outsole you’re guaranteed slip-resistance and balance on various surfaces both wet and dry so whether you're working in the office or enjoying a weekend away, you can do so comfortably and confidently. 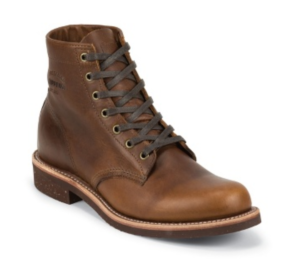 For all day support, Chippewa’s AldrichTan 6-inch tall men's lace-up boot features a rugged golden brown leather exterior and thick brown waxed cotton laces for durability. Crafted for comfort, this boot’s Texon Poron cushioned maple leather covered insoles and the steel shank provides lasting support all day long. 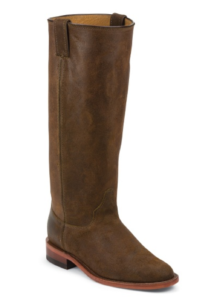 Effortlessly cool and versatile, the Gale Brown 15 Boot 15-inch tall women's boot features a distressed golden brown suede exterior that gives it a lived-in feel and a classic riding boot silhouette. So whether you're keeping things casual in your denim or elevating your look by pairing with dress, you'll be doing it stylishly and comfortably. The online USA USA Chippewa online store store has by far the largest range of Chippewa products in the world. The USA Chippewa online store unfortunately does not offer international shipping. Not to worry though! Big Apple Buddy, your personal shopper, can help you buy products from the USA Chippewa online store and ship them to your doorstep, no matter where you are in the world. We offer international shipping to over 110 countries including Australia, Austria, Azerbaijan, Bahrain, Belgium, British Virgin Islands, Brunei, Bulgaria, Canada, Chile, Costa Rica, Croatia, Czech Republic, Denmark, Estonia, Fiji, Finland, France, French Polynesia, Germany, Gibraltar, Greece, Greenland, Hong Kong, Hungary, Iceland, Indonesia, Ireland, Israel, Italy, Japan, Jordan, Kuwait, Latvia, Liechtenstein, Lithuania, Luxembourg, Macau, Malaysia, Maldives, Malta, Marshall Islands, Mauritius, Monaco, the Netherlands, Netherland Antilles, New Zealand, Norway, Oman, Poland, Qatar, Romania, San Marino, Saudi Arabia, Serbia and Montenegro, Seychelles, Singapore, Slovak Republic, Slovenia, Spain, South Africa, St. Lucia, Sweden, Switzerland, Taiwan, Thailand, the UAE, the UK, Vatican City, and Vietnam. If you would like to buy from the USA Chippewa online store, simply let us know which items you would like to order (by filling out the form below) and we’ll get back to you with a free international shipping quote within 24 hours!